While the Germans may lead overall and particularly when it comes to “improvements” to the internal combustion engines, Tesla and China’s manufacturers too are becoming increasingly innovative in what we consider future fields. To put the numbers in context: for this year’s study, CAM analysed and categorised more than 1,200 innovations filed in 2017/18 in order to evaluate the individual power to innovate of 36 car companies from Europe, Japan, the USA and China. 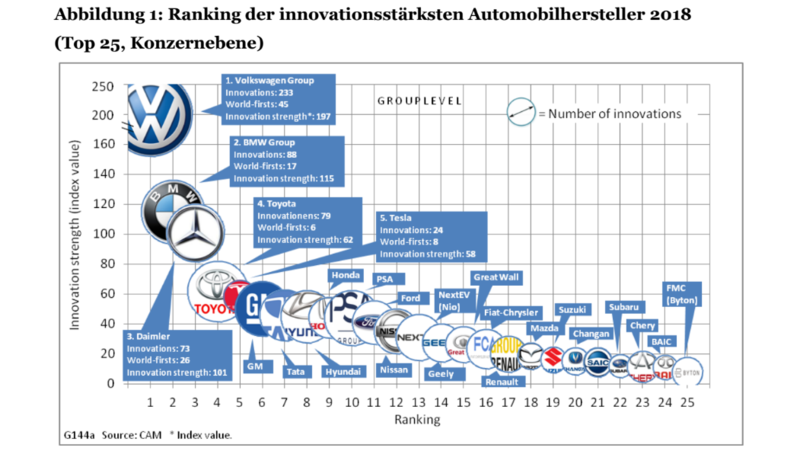 Volkswagen, BMW and Daimler lead the overall ranking, with the Wolfsburg-based company (including its brands VW, Audi and Porsche) having filed a total of 233 individual innovations, including 45 world firsts, that position them right on top of the list. 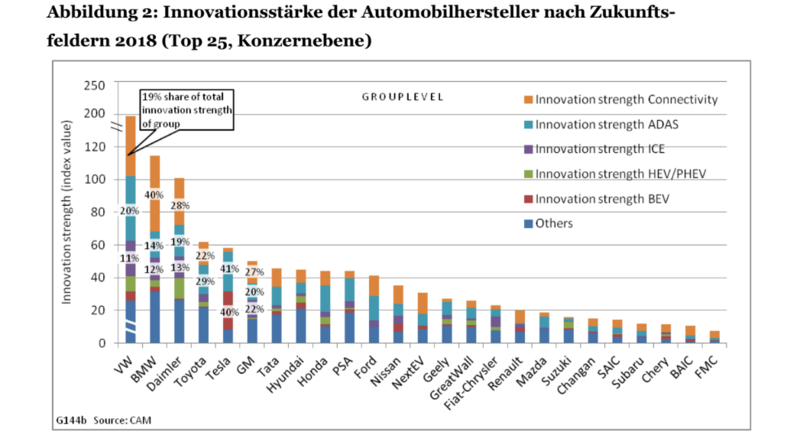 The Germans are followed by Toyota that gained most among all carmakers and thus secures rank 4 in the innovation list, 11 positions higher than last year. Their innovative strength lies in automated and connected driving mostly and was also driven by Lexus. And than there is a Tesla that made a brilliant third place last year and slipped to a good fifth place in this year’s overall ranking. When it comes to China, Geely was the only Chinese manufacturer among the top 25 two years ago. This year however, there are eight. Particularly quick to catch up was Nio through their electric car brand NextEV that drove them straight onto position 13. Looking at the ranking from an e-mobility point of view, it is noticeable that only 3 to 1 percent of the German leading trio’s innovative strength comes from that field (and 13 to 11 percent from the improvement of the combustion engine!). The same goes for Toyota that draws 8% of strength from ICEs. CAM puts the meagre result of the Germans into perspective, saying that the percentage will change once current product developments will take hold in the coming years. Yet, by comparison, 40 percent of Tesla’s innovative strength is firmly anchored in the field of electric transport. Tesla recorded 24 innovations in the study, including 8 world firsts. CAM emphasises the Californian’s striking focus on future fields of connectivity, ADAS and pure e-mobility. It accounts for 86 percent of Tesla’s total innovative strength. Speaking of striking: The study also sketches how remarkably quick Chinese companies are catching up. Nio, Geely and Great Wall occupy ranks 13 to 15, followed by five other manufacturers from the People’s Republic. Different from German manufacturers, Chinese carmakers almost completely ignored internal combustion engine technology. The study too identifies alternative drives and connected/autonomous driving as future technologies. For 13 years, CAM has been collecting several hundred vehicle innovations per quarter, categorised in approximately 50 criteria such as technology, type of innovation, originality (world’s first), degree of maturity (series-ready), etc.. They are then evaluated using the MOBIL approach. This results in an index value for each innovation, which can be condensed into overall values for individual groups, brands or models. CAM considers itself an independent institute for empirical automotive research and strategic consulting.